You can manage your Amazon Developer account within the Appstore Developer Console. You can give other users permissions to your account, update your contact information, and more. 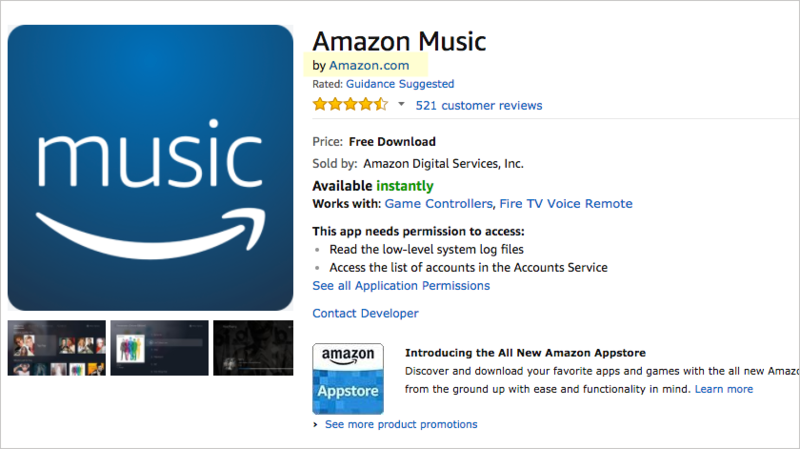 You must create an Amazon Developer account in order to publish an app in the Appstore. If you already have an Amazon.com account but not an Amazon developer account, you can optionally sign in with your Amazon.com account. On the backend, the Developer Console will create a developer account using your Amazon.com email address, and then the two accounts will be tied together and synced. You will be prompted to complete the registration profile pages in the Developer Console. Click Sign In in the upper-right corner. Click Create your Amazon Developer account. Complete the requested fields for your name, email, and password, and then click Create your Amazon Developer account. Complete information about your name and contact information. Here's more information about some fields on this tab. Important: After you save this information in your profile, the "Developer name or company name" field is no longer editable. If you need to change it, submit a request by going to Support > Contact Us in the Developer Portal. Provide us with your company's desired new name. Note that developer account name changes will be immediately visible on your account but may take up to several days to appear on the retail sites. Developer Description. This information is not shown on your App details page or anywhere else on the Developer Portal. Note: The phone number is not listed on your app's detail page. This information is solely for internal use in the case that Amazon needs to contact you with questions regarding your app or developer account. The More apps by this developer (shown in the screenshot above) link lists all other apps published with your same company or developer account. You can edit this information at any time by going to Settings > My Account and Settings > Company Profile in the Developer Console. This agreement is required to distribute your app. You can review the agreement at any time here: App Distribution and Services Agreement. If you plan to monetize your app, you need to submit some information about how Amazon can pay you, as well as tax forms. If you don't want to set up this information now, you can do so later by going to Settings > Payment Information. If your company has multiple users who work on app development and submission, you can give them access to your organization's account. You can also assign each user a role that limits their permissions within your account. You add users to your Amazon developer account by going to Settings > User Permissions. There are four roles that each user on a company's developer account can have, each with unique permissions. Administrator: This role grants complete access to all sections of the developer account, including reporting and payment information. Most importantly, any account administrator has the ability to manage user permissions, including inviting or removing users from the account. Marketer: Outside of an Administrator, this is the only role that gives users the ability to edit the content associated with apps (i.e. Descriptions, Images & Multimedia) and IAPs. Like the Analyst, this role also gives access to sales reports. In the Alexa Developer Console, this role can access all Alexa Skills Kit areas except the Payments and Earnings sections. Analyst: Outside of an Administrator, this is the only role that gives users the ability to view earnings reports. Like the Marketer, this role also gives users access to sales reports. In the Alexa Developer Console, this role can access all Alexa Skills Kit areas including the Payments and Earnings sections. Developer: Outside of an Administrator, this is the only role that gives users the ability submit and adjust application files. In the Alexa Developer Console, this role can access all Alexa Skills Kit areas except the Payments and Earnings sections. This role can also use the ASK Command Line Interface (CLI) and make changes through the Smart Home API (SMAPI). Choosing the correct user permissions for each user allows the account owner to control what each user can see or do in the company's developer account. The following table shows the permissions by role. Manage apps on the APK Files tab or App Files tab tabs. Manage app details on the Description tab. Manage information on the Settings > Company Profile tab. Manage/view information on the Settings > Payment Information tab and view Reporting. Manage information on the Settings > My Account tab. Manage user permissions at Settings > User Permissions. Manage skills in the Alexa Developer Console. Manage Alexa skills using the command line interface (CLI) or Smart Home API (SMAPI). View/manage information in the Earnings and Payments tabs of the Alexa Developer Console. You can view a similar permissions matrix by going to Settings > User Permissions and clicking Show permissions matrix. Tip: More information about the permissions for users within the Alexa Developer Console can be found in Manage Skills in the Developer Console. To remove a user from your organization's developer account, go to Settings > User Permissions, and click Remove access next to the user you want to remove. The first user associated with the Alexa Developer Account is considered the owner and will retain full rights to administer the developer account. Additional users can be invited to have access to the developer account. Invited users will have the rights associated with the roles assigned to the user. Note that as an account owner, you are responsible for all activities that occur under the accounts you authorize. Amazon will send email only to the address listed in the company profile when corresponding with you about your app's status. When you set up a new Amazon developer account, you are the default account administrator. You can add other people in other roles to the account, such as analyst, developer, or marketer. You can also add other administrators. Although any developer or administrator can submit an app, Amazon will send correspondence only to the email address in the company profile. Amazon will not send messages to the email account associated with the person who submitted the app, unless that person's email address is the email address in the company profile. To see which email address is listed, an account with administrator permissions can check the Company Profile on the Settings tab. Sign in to the portal, click Settings, and then click Edit to edit your email address, account information, company profile, and user permissions. If you do not have administrator permissions, ask the account administrator to make the changes. Note that your account contact information isn't necessarily the same as your app's contact information. When you're viewing an app, the General Information tab lists the contact information for the app. There's an option to use the same contact information as your account. Sign in to the Developer Console. Your customer ID and vendor ID are shown on the screen. Log into your existing Developer Portal account. Fill out the required fields to create the new Developer Portal account. Make sure to use a unique "Developer name or company name" for the new account. To switch between accounts you can use the drop-down selector next to your name located at the top-right corner of any page. You are a freelance developer who wants each client to have their own Developer Portal account. Your company creates apps across multiple content categories. You can use this feature to use a different company name, or brand, for each app category differently. Your company owns multiple companies or has multiple divisions. You can link the parent company to the new companies' Developer Portal account. Sign in to the Developer Console and go to Settings > Contact Us. Alternatively, go directly here: Contact Us form. Only users with the administrator role can change payment information. In the Developer Console, go to Settings > Payment Information. For security purposes, the information is not shown on the screen. Click the click here link to view empty banking fields that you can repopulate and submit, overwriting the previous information.